Conrad Murray Prosecution What's Wrong with This Picture? 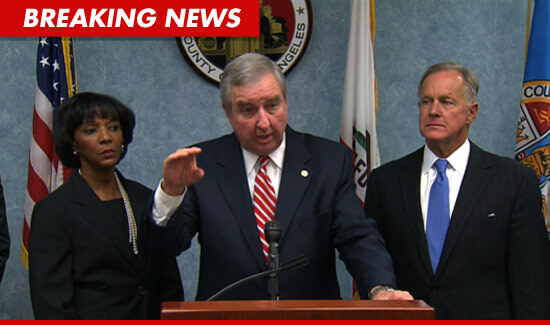 Conrad Murray Trial Prosecution -- What's Wrong with This Picture? The man of the hour -- Prosecutor David Walgren -- who won the Conrad Murray case, might as well have been sent to Siberia by his boss, L.A. County District Attorney Steve Cooley, because he was completely out of the shot as Cooley took credit for the victory. It's pretty stunning, given that the winning prosecutor typically addresses the media after a verdict, but even if the D.A. was exercising caution while the sentence is pending, Cooley didn't even allow Walgren to stand next to him. Instead of Walgren, Cooley was flanked by his number 2, Jackie Lacey, and D.A. honcho Pat Dixon. Choosing Lacey is an audacious move on Cooley's part, since he personally chose her to run as his successor in the 2012 election. A D.A. spokesperson said Lacey was standing next to Cooley because, "It's like Captain Kirk and Mr. Spock."